Toni Payne Concepts & Blarque Brotha Entertainment in association with City People Entertainment present a World class event with Nigeria’s powerful voices and performers; Soul Superstar GT (The Guitarman), Angelic voice singer Adol and Nigeria’s fastest rising pop group, Plus One. The event tagged “MUSIC 4UR SOUL: "A night for lovers of good music” will present the artistes performing live at Ember Creek, Awolowo Road, Ikoyi alongside two of Nigeria’s smoothest bands; The BandWagon & The EmBand. GT The Guitarman is a contemporary Soul/R&B singer, songwriter and producer. His smooth, sultry and seductive style is reminiscent of the classic soul of yesteryear. GT’s music comes from the heart and speaks to the soul with his heartfelt and emotive lyrics. He has an album (The Truth) to his credit and has achieved many accolades. ‘Dreamer’, the first single off his debut album was an instant hit. He is currently working on his sophomore album. Adol, known to have one of the richest voices in the Nigerian Music Industry, shot to the limelight with his first single titled Orin. In March 2011, he released an album also titled "Orin", which contains hit songs like Gugu Gaga, Omoge, Ghetto Life and more. He has since won himself respect and fans across Nigeria and beyond. Adol’s angelic voice and believable rendition of songs is what sets him apart from his peers. Managed by one of the most reputable management companies around, Adol is definitely on top of his game. Plus One is a Nigerian pop group that’s rocked stages and held fans spelbound home and abroad. Their first single Tin Kon Ko, attracted rave reviews and mad airplay on both radio and TV, this instantly won the group fans and following from far and near. With an album ‘Commercial Class’ and awards to their credit, this trio is sure to be on top for many years to come. 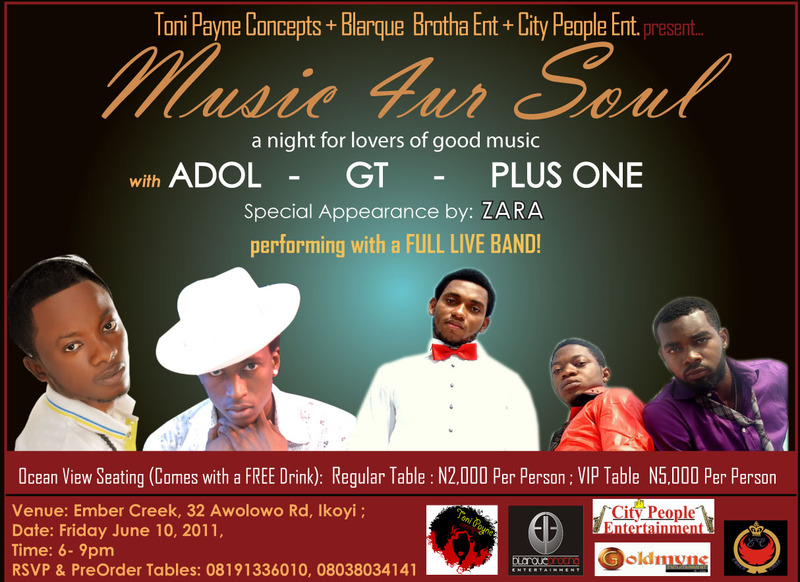 Goldmyne Entertainment, also feature special appearance by one of Nigeria’s songstress and female emcee, Zara.